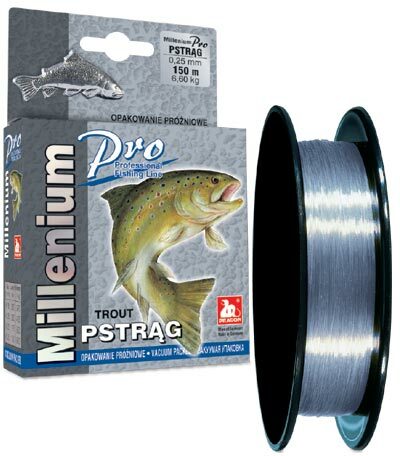 Millenium Pro Trout. Discounts Apply ! You need no longer compromise: with Millenium Pro you can angle for the fish of your choice with exactly the right line! Color, suppleness and stretching properties have been adapted to match exactly the habitat and biting actions of the respective target fish, in high-tech quality. Fantastic trout line. Abrasion resistant, UV radiation resistant, excellent linear strength. Transparent with light fluorescent component is invisible even in crystal clear water of trout rivers and streams while an angler can control and observe above-water section with ease. Colorless, with delicate florescent flash of violet. Made in Germany.